The Temple represents the Wheel of Fortune of the Tarot. At its axle is the Altar on which sits C[entrum].I[n].C[entri].T[rigono]. On the rim, S[phinx] at East spoke, H[ermanubis] at North-West, T[yphon] at South-West. To the West of the Wheel is a veil. The axle of the Wheel is represented by Centrum In Centri Trigono, Latin for “the point in the center of the triangle,” an allusion to the Eye in the Triangle. C.I.C.T. is Jupiter, the source of the triune principles hidden at the center of the Wheel. TYPHON: Hail unto thee, thou great god Hermanubis! Art thou not the messenger of Jupiter? 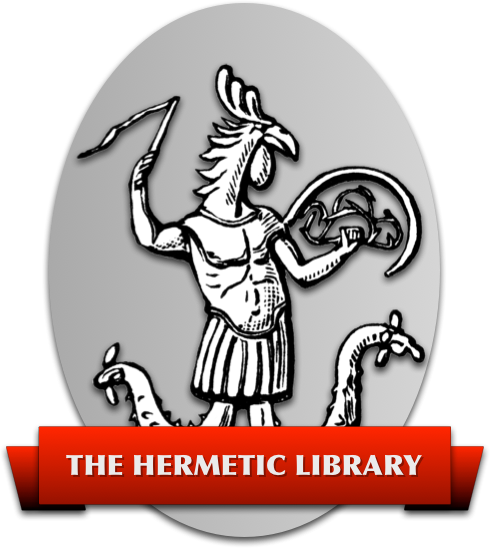 HERMANUBIS: Hail unto thee, thou great god Typhon! Art thou not the executor of his vengeance? SPHINX: Neither by sloth nor by activity may even my secret be attained. Neither by emotion nor by reason may I even be understood. How then should ye come to the centre of the wheel? The Sphinx identifies Typhon with sloth and emotion, and Hermanubis with activity and reason, qualities associated with the Gunas they represent. HERMANUBIS: Mother of mystery, what is thy position on Olympus? SPHINX: Upon the rim of the wheel. Are but the cerements of Me. Ye are but satellites of the One. And all the parts become the Whole. When will ye learn that ye must cease? TYPHON: How should I cease from lethargy? HERMANUBIS: How should I quench activity? SPHINX: How should I give up ecstasy? C.I.C.T. : What shines upon your foreheads? S,H,T (together): The Eye within the Triangle. C.I.C.T. : What burns upon your breasts? S,H,T (together): The Rosy Cross. C.I.C.T. : Brethren of the Rosy Cross! Aspirants to the Silver Star! Not until these are ended can ye come to the centre of the wheel. I heed not the passion, or the reason, or the soul of man. Irreconcilable, my children, how shall ye partake of the Banquet of Jupiter, or come to the centre of the wheel? For this is the secret of Jupiter, that He who created you is in each of you, yet apart from all; before Him ye are equal, revolving in time and in Space; but he is unmoved and within. After a pause, Typhon recites poetry proclaiming the flow and ebb of life as the Earth passes from Spring to Winter, effectively cooling his passion. He moves to the East, crouches before the Sphinx, and faces C.I.C.T. Hermanubis recites poetry that celebrates the awakening of the Kundalini serpent, inflaming him with passion, and then joins Typhon, crouching before the Sphinx. Thus we have all three principles combined into one, oriented upon the center of the wheel. C.I.C.T. gives a speech, and then allows the banquet of Jupiter to begin. The three Officers move to the center to attend to C.I.C.T., and then the nature of the rite changes and departs from the realm of the Fortune trump. C.I.C.T. is veiled, and when the veil is drawn he is revealed as Jupiter. It is thus demonstrated that only when these three principles combine and cease to move that they will come to the center of the wheel and the godhead shall be known. 1wheelofjupiter Crowley, Aleister. The Book of Thoth, page 257. Originally published as part of “The Two and Twenty Secret Instructions of the Master” in The Heart of the Master. 2 Crowley, Aleister. The Book of Thoth, page 90.